Today would have been the 566th birthday of Leonardo da Vinci, the original Renaissance man best known for dreaming up brilliant inventions, painting the Mona Lisa, and inspiring trashy thrillers about conspiratorial codes. That’s some fascinating stuff (except for the trashy thriller part), but at this website, we’re all about the autos. So let’s discuss one of Leonardo’s lesser-known contributions: the set of sketches where he dreamed up a self-driving vehicle. 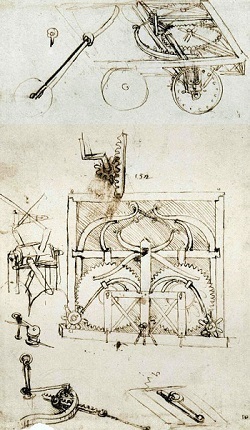 Leonardo’s sketches date from around 1478 and shows plans for what appears to be a small self-propelled cart. Historians suggest that he designed it for use in theatrical settings or as an attraction at Renaissance festivals. For hundreds of years, scholars tried and failed to create models that were powered by a pair of leaf springs depicted in the sketches. Finally, researchers made a breakthrough in 2004 based on a careful re-examination of Leonardo’s plans. 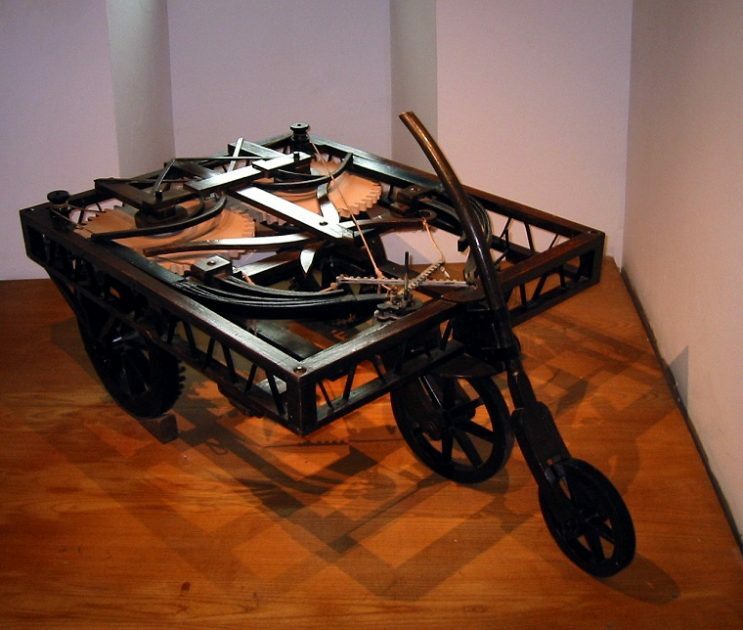 A team at the Institute and Museum of the History of Science in Italy was able to build a one-third scale working model of the cart. It’s powered by coiled springs held inside cylindrical casings underneath horizontal cogwheels. Once the springs are wound up, the model functions like a wind-up toy vehicle. It also includes programmable steering, achieved by placing wooden blocks between the cart’s gears. The steering mechanism allows the cart to travel straight or at angles to the right (but not to the left). There’s also a mechanism that provides remote braking. 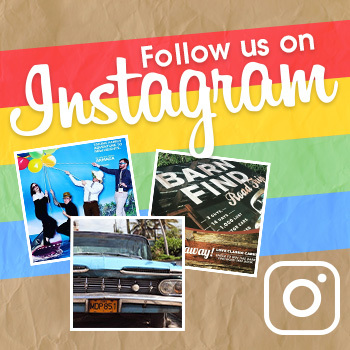 Pretty nifty, huh? It’s just one more illustration of Leonardo’s genius — more than 500 years later, with self-driving vehicles finally becoming a reality, we’re just now catching up to him.